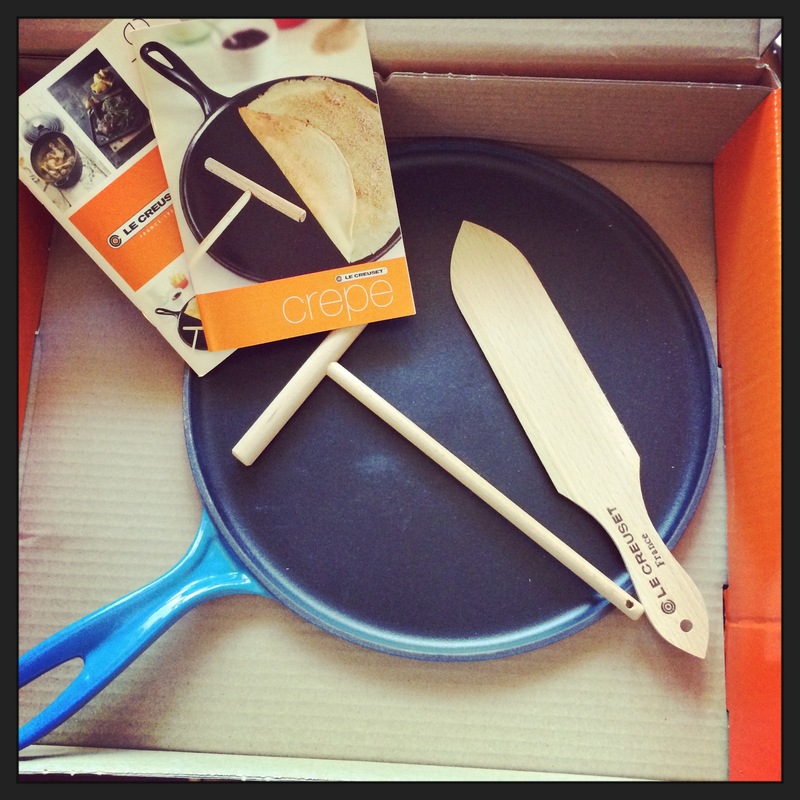 My husband and I recently celebrated our sixth “iron” anniversary and he surprised me with a beautiful Le Creuset crepe pan. I’ve always wanted to delve into the art of crepe making and now I have my chance. I have yet to sink in to the savory – which I do plan to do and share! 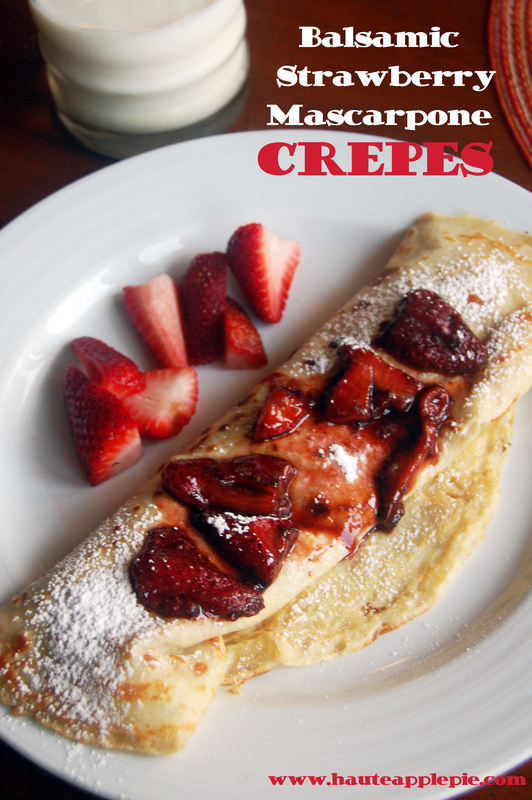 – but my first test run with making a sweet breakfast or dessert crepe was extraordinary. Crepes are a really simple batter and easy to make as long as you have a good pan, good utensils and a good eye for flipping. These are best made to order or keep the crepes warm in an oven warmer while you make the rest. This mixture of the balsamic vinegar and strawberries is one of my favorites and paired with the creamy sweetness of the mascarpone and whipped cream filling, it tasted just like a small gift from heaven. This will be a great recipe in a few weeks after we pick strawberries! Preheat crepe pan on medium high heat. Add all ingredients and beat with electric mixer or hand blender for 4-5 minutes until smooth. Add small pat of butter to pan and melt. Pour batter into center of pan, making a circle about half the size of the pan. Using crepe utensil, spread batter in a circular motion and allow to fill toward the edges. Cook crepe for about 2-3 minutes (depends on temperature of pan) and flip when edges become firm. Cook for another 2-3 minutes until golden brown. In a cold bowl, beat whipping cream until stiff peaks form, about 10 minutes. Set aside. With a paddle attachment, beat mascarpone, powdered sugar and vanilla until smooth. Gently fold in whipped cream and set aside. In a heated saute pan, add strawberries and balsamic vinegar. Cook until vinegar reduces to a syrup consistency and strawberries soften. About 10-15 minutes. Spoon mascarpone mixture down center of crepe and add strawberries. Roll to fold and add more strawberries and balsamic syrup to the top. Sprinkle with powdered sugar.